Can we keep blaming the Referees ? A story that has been circulating in the UK media this week about Deaf footballers is a prime example of how the media influences public perception about Deaf people and their involvement in sport. How have the readers reacted? 20% showed their support to the Deaf players and felt referees should be trained to be deaf-friendly with flags. It is a worrying statistic to see 36% prejudiced against Deaf people. This appears to reflect a similar study of racism in the 2013 British Social Attitudes Survey published this week declaring that 1 in 3 people surveyed admitted to being racially prejudiced. As I mentioned in my last post, it is often said that the rules of sport do not need to be modified for deaf athletes and players. This is misleading, it should be pointed out that the playing environment does need to be adapted – everyone in football does need to become more deaf aware and if they really believe that they are inclusive, they have to take action and compensate by using flags. But, quite rightly, there are Deaf football teams who perform consistently well against hearing opponents and so referees not waving flags is not the only reason for the failure of Birmingham Deaf FC. UK Deaf Sport staff are investigating the matter and have been working with Birmingham FA and the UK Deaf Football Federation to move forwards and make improvements. When UKDS consulted with partners at Birmingham Institute for the Deaf who have been supporting the football club it was reported that team are unhappy with how the story has been portrayed, the team are the first to admit that they did not play well, and due to lack of organisation and commitment ended in a very poor result. “From what we can tell, the reporter focused on the issue of lack of flag usage”. 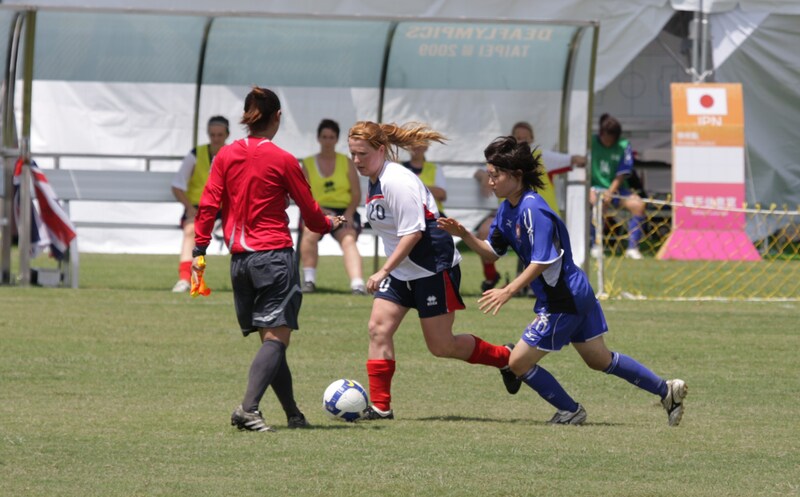 Whilst there are many factors that will affect a team’s performance in a competition, the fact remains that in team sports, if the players do not feel they can trust officials to be unbiased they will not be motivated to sustain their involvement and seek ‘the level playing field’ elsewhere. To be truly inclusive governing bodies of sport need to be more proactive and take their responsibilities seriously by working with Deaf sport to provide the right level of training an awareness that is required of everyone involved, players as well as officials. Enterprising companies have used wireless digital technology to create vibrating armbands that react when a whistle is blown. But this technology is far too expensive and beyond the reach of the regular amateur club, so for now, football needs to follow the Deaflympic protocol for match officials to use visual signals to signal that the whistle has been blown. For a more in-depth study of how the media portrays the Deaflympics, read Same Spirit Different Team available now from Action Deafness Books. This entry was posted in Deaf Sport, Deaflympics, Prejudice against deaf people and tagged 2013 British Social Attitudes Survey, Action Deafness Books, Birmingham Deaf FC, Birmingham FA, Birmingham Institute for the Deaf, Birmingham Mail, Deaf football, Football referees, Metro, North Riding County FA, prejudice, Same Spirit Different Team, The Mirror by sharrison64. Bookmark the permalink.